There is no strict definition of ASP .NET rich control but generaly these are controls whose object model is largely separate from the HTML they generate. Rich controls are still handled as single objects, they only differ from normal controls in terms of more complex HTML and user interface being generated. Users can click on the arrows on the upper corners to switch from month to month or click on a date to select it. The selected date can be retrieved as a DateTime object from the property Calendar.SelectedDate. 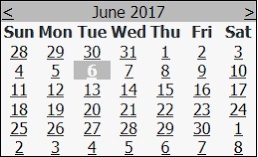 As you can see above, the Calendar can be altered both as style and functionality. Apart from ordinary CSS tricks, there are several properties that can be used to achieve a better looking calendar: DayHeaderStyle, DayStyle, NextPrevStyle, OtherMonthDayStyle, SelectedDayStyle, SelectorStyle, TitleStyle, TodayDayStyle, WeekendDayStyle. 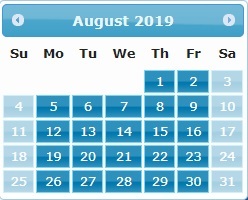 When it comes up to more advanced styling, there are several Calendar Members that can modify it: Caption, CaptionAlign, CellPadding, CellSpacing, DayNameFormat, FirstDayOfWeek, NextMonthText, NextPrevFormat, PrevMonthText, SelectedDate, SelectedDates, SelectionMode, SelectMonthText, SelectWeekText, ShowDayHeader, ShowGridLines, ShowNextPrevMonth, ShowTitle, TitleFormat, TodaysDate, VisibleDate. // Restricting all weekends before today. When inspecting the result on the browser, you can find out that this control generates the well known “<input type=”file”>” HTML tag. Since this tag doesn’t provide almost any customisation options, the FileUpload control isn’t quite customisable either. Generally, it represents a rectangular box containing a button-like graphic inside. When clicked on, this control opens a dialogue window to browse for files from. Once a file is chosen, it is displayed on the FileUpload control. However, this doesn’t mean the file is uploaded. It’s just readied and is uploaded later, when the page is posted back. executionTimeout is commonly used alongside maxRequestLength and it restricts the time in seconds for a file request to be executed. While extremely useful in some scenarios, maxRequestLength shouldn’t be used when not needed because abnormally large files can temporarily block the ASP .NET threads and even be part of Denial of Service (DoS) attacks. AdRotator is mainly used to switch through randomly selected images previously collected in a group. Most users have seen the AdRotator in action when they open a page containing banner ads. AdRotator’s are easily implementable on ASP .NET pages and even more, the predefined images can be stored separately inside the config file. Impressions – determines how often the banner will appear. A banner with impressions value of 8 will appear twice more often than one with value of 4. Unlike most cases when users surf through multiple web pages, these controls provide the option to load different views for the same page or different steps of the task performed on the same page. Or to avoid troubles connected with the transfer of data from one page to another. The recognised command names are: PrevView, NextView, SwitchViewByID and SwitchViewByIndex. In the example above the value in CommandArgument is used for the purpose of the command name SwitchViewByID (in other words switching to the view with id=”View2″). Command names PrevView and NextView do not need this CommandArgument. Wizard is the more complex version of MultiView. It can (and will do by default) show a sidebar with navigation through different steps in a task thus providing the option for the user to skip certain task steps. An important difference between Wizard and MultiView is that controls in the Wizard aren’t set to automatically post back. This is like that because wizards are generally used when a task needs to be completed without strict step order limitations. In wizards the postback happens once the final step is completed. This provides an additional advantage because the page is not slowed down due to all of the postbacks that happen when using MiltiView.